Symbols*: After a time of bad storms and potential danger, the prairie dogs reemerge into the sunlight and begin to play and frolic on the peaceful, sunlit plateau. 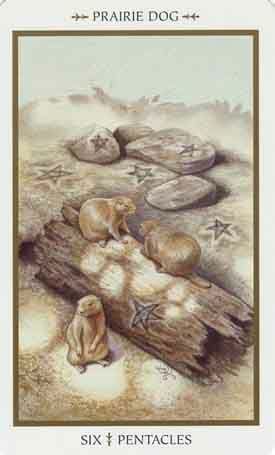 The prairie dogs exemplify the need to go with the flow and to enjoy playful interludes. They are living in the moment, using an old log, symbolic of a tumultuous past, as a tool for cavorting. The prairie dogs have embraced the wooden relic as an integral part of their environment and refuse to see it as something that had perished during inclement conditions. Sunshine dots the earth with its renewing rays. Large rocks symbolize endurance and the stabilizing powers of the earth element. Description*: You can now enjoy a period of success. Peace and well-being will reign and allow you to reach into a deeper part of your being to achieve overall equilibrium. Your positive outlook has an impact on your surroundings. People around you begin to absorb your good energy and reciprocate the positive vibes. Thoughts/Points to Ponder: These small prairie dogs are a reminder of a collective community, unity, and coming together as one. Their social skills are very important to them, but be careful not to be too involved. The fog in the background is a reminder of obstacles or something that could have been. Prairie Dog demonstrates a sense of community and family, a caretaker of everyone in cooperative environment. He shows how to create meaningful bonds and make those long-lost connections to loved ones. Is there someone you need to contact? Prairie Dog teaches about diet and the importance of the balance of vegetables and regular quantities for health inducing activities. He will aid in examining one's own social ability: enough or too much?. Prairie Dogs aid in expressing feelings, communication, and meaningful expressions. He makes you aware of current responsibilities; those that you may be neglecting and those that need less attention. It is time to look deeply into aspects in of your life and discover what truly matters. Because of their digging habits, people with this totem need to examine if they are involved enough in the aspect of their loved ones lives - or conversely, are they too involved?